Zeibe Textile Cleaner is the only laundry detergent in the market specially developed to clean textile garments of motor riders. Continuous exposure of textile garments to pollution, exhaust pipe gas and weather conditions, affect not only to its cleanness but also to its technical characteristics. Textile garments membranes could be blocked due to dirt accumulation and affect its waterproof and perspiration capacity. Zeibe Textile Cleaner has been specially developed to clean spots of hydrocarbons, oil, grease and mosquito blood without damaging the technical properties of waterproof membranes. Its formula is based on cleaning recommendations of main equipment brands. Caution: Using non specific product to clean motorbike textile garments could damage their technical properties. For instance clean a jacket in the washing machine with washing powder could break the membranes and block the pores affecting its waterproof and perspiration. 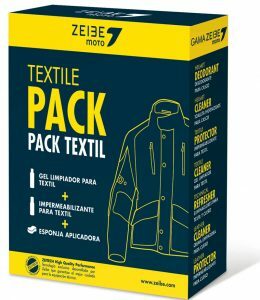 Zeibe Textile Protector is a technical waterproof for motor biker textile garments with or without waterproof membranes that allows you to recover its technical qualities. The normal use of textile garments and the continuous exposure to wheater conditions provokes the loss of external waterproof. Its formula is based on the use of fluor polymers to create an extra protector coat, waterproof and that avoids oil and grease spots to achieve the textile coat of the garment. It does not contain gas.